I really like the taste of these Potato Chips. Salty and delicious, with the hint of black pepper, this is another addictive snack. 1. Add in all ingredients and seasoning into mashed potato, mix well into a dough. 2. 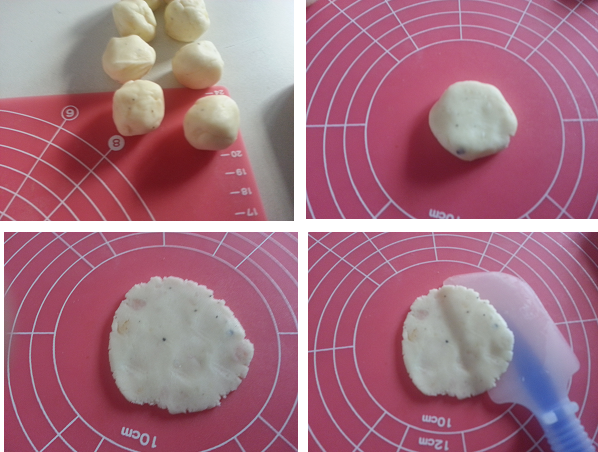 Cut the dough into 10g each and roll them into balls. 3. Use a rolling pin to flatten the ball into 0.3mm circle of thin dough. 4. Place the circles of dough on a baking tray, then bake in a preheated oven at 170°C for 15 - 18 minutes, then turn the heat down to 150°C and bake for another 5 minutes. 5. Turn off the oven but leave the chips inside until cooled. 6. You can also add seaweed, paprika, sesame or yogurt powder to enhance the flavor. Note to self: My oven's temperature is 180°C and 160°C. Unfortunately, the chips were not very crispy. According to my master, Eileen, this was due to my lack of skill in rolling the dough and controlling the temperature. She also mentioned that while rolling the dough, it is best to wrap it with cling wrap. That way, the dough can be easily rolled into thin slices. It also makes it easier to transfer the dough onto the baking tray. 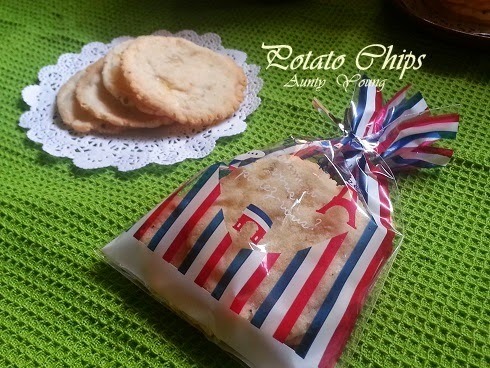 Why not try these home-made Potato Chips as an alternative to commercial ones? crunch..crunch..crunch...aiyo, Aunty Young, my diet "pao char" liao! hee..hee..
look so nice, must try it out! Hi Aunty Young, this is such a delicious and healthy snack! Thank you for sharing! 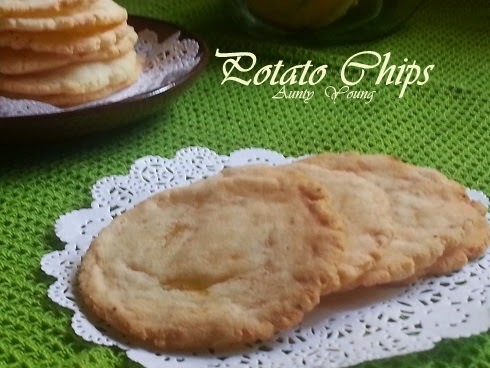 Oh wow, what a wonderful way making your own potato chips ! 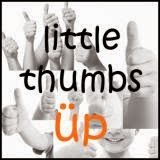 Thanks so much for sharing it. 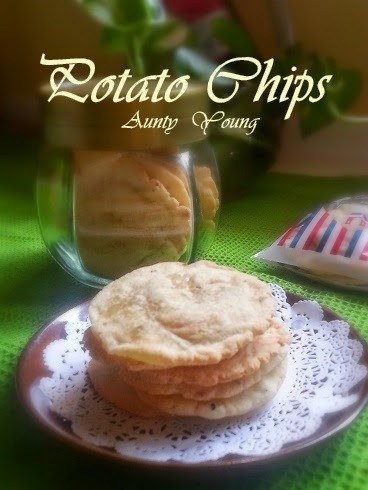 Wow, never imagine we could make our own potato chips at home! 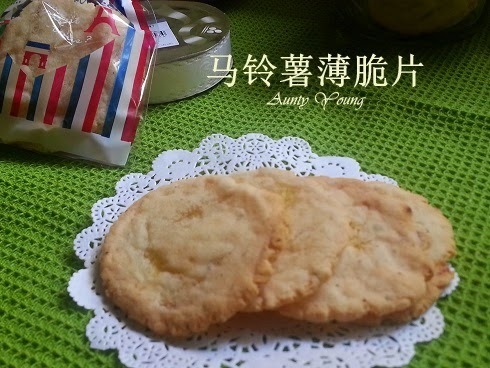 Thank you very much Aunty Young for sharing this wonderful recipe. Aunty Young....everyday you post do many nice food...how am I going to go on diet.. Wow!, didn't know these can be baked just like that. Must make some to snack on. Just wish I can have a bite now.